Even though it has been Christmas and New Year, we have been busy over the last two weeks – we don’t get a break as we still have had to feed all the stock and do jobs that need to be done. 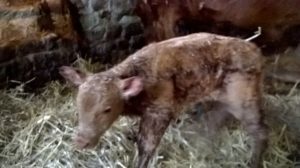 The heifers started calving before Christmas and they don’t stop calving just because it’s Christmas! 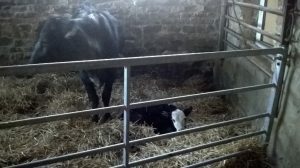 We have had six calve over Christmas and New Year, but they all calved easy and the calves got up sucking straight away. This was a nice change to the heifers and cows that calved last year which were very difficult. So we hope that the remaining ones are all just as good! Also over Christmas I normally mange to have a catch-up with moling. The moles seem to have gone mad over the last month, they just seem to have appeared with the weather being so varied in temperature. The moles root hard and move fast on the warmer days and when it is cooler they don’t move as fast, so they are harder to catch. This is a never ending job but it is a good job to have a run round the traps and burn off some of that Christmas dinner! Every year we receive the Basic Payment from Defra, which is meant to come on or after the 1 December and now we have reached the New Year we still have not received it. The annoying thing is that we have not yet received all of our 2015 payment and now Defra (the government department in charge) seems more bothered about getting as many of the 2016 payments made before sorting out those outstanding from 2015, which is very frustrating. We have not received all of the 2015 payment because there is a problem with the computer system as it does not recognise common land or shared grazing, so it cannot work out what it is meant to pay us. This payment was what used to be called subsidies, and is meant to help support the farmer. As we still hadn’t received the payment my dad contacted the local MP and he tried to contact Defra to get an answer but they could not say when it would be that they will pay us. As this is my last blog, looking back the year has been an interesting one and I hope that I have explained things that people never really knew about farming and that you have learnt something from them. No day is ever the same in farming – you never know what is going to happen next and with the uncertainty about leaving the EU we don’t know whether what we produce will be worth anything and whether it will allow people to keep farming the way that we do. This is the main thing that will affect the future of British farming and people may not realise just how big an effect it will have until we have left. I never really thought that many people would read the blog, but it seems to have been popular and people have said to me that they have learnt something from it. Let’s hope 2017 is going to be a good year and that some positive things happen for the future of farming.